All boys love to play ball, especially basketball. 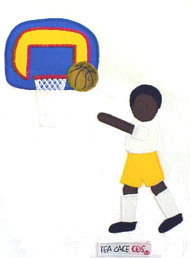 This character is shooting around and having fun. White t-shirt 50/50 Poly Cotton Blend with custom design appliqué of character.